UPSEE BHMCT 2019: Dr. A.P.J Abdul Kalam Technical University, Uttar Pradesh has released the admit card for UPSEE BHMCT 2019 on April 15, 2019, i.e today. 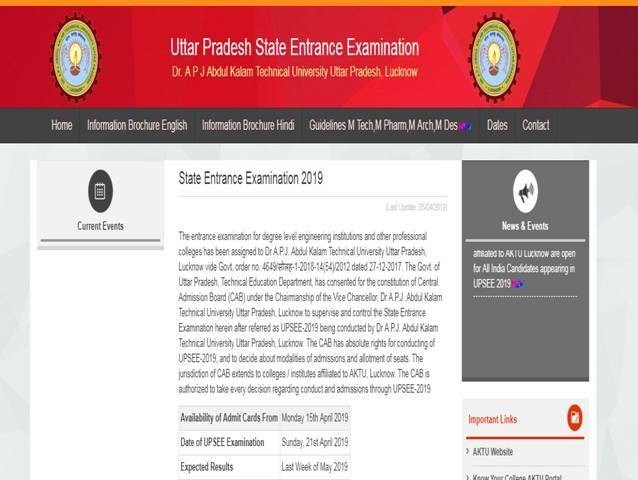 Candidates who have completed the Uttar Pradesh State Entrance Exam 2019 applications can download the admit card through the official website of UPSEE 2019. The admit card of UPSEE BHMCT 2019 is the document to be carried on the day of the examination. The admit card of UPSEE BHMCT 2019 is available online for download. The conducting body of the examination will commence the examination on April 21, 2019. The admit card is available for download until the examination dates. The admit card of UPSEE BHMCT 2019 contains the following details- Candidates name, application number, photograph an signature, examination details such as exam centre name and address, reporting time at the centre, duration of the examination, category, sub-category, gender, rural weightage, subjects appearing for, and instructions to be followed on the day of the exam . Candidates must make sure to cross check all the information given in the admit card. In case of any wrong information, the candidates need to contact the authorities for the same. In case candidates are unable to download the admit card they must contact the helpline as indicated on the website or send an email to the mail address upsee.helpdesk@aktu.ac.in latest by April 20, 2019. Candidates are required to produce the admit card during the counseling process hence, they are advised to keep a copy of the admit card until the admission process is completed. The results of UPSEE BHMCT 2019 are expected to be released in the last week of May 2019. Candidates must check the website for regular updates.